A little planning goes a long away, and a lot of planning makes for a great event! 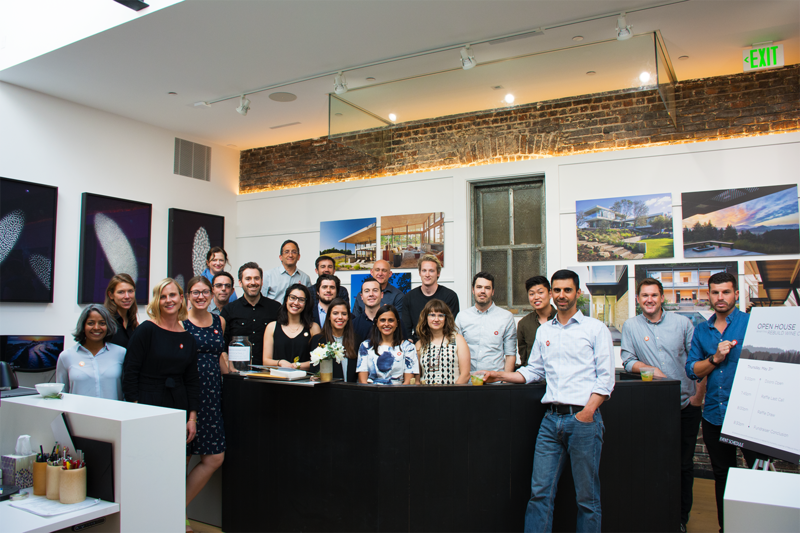 A few weeks ago we hosted our first Open House Fundraising Event in our new design studio. This has been my project since I started here at Feldman so it was especially satisfying to see it all come to fruition. We invited a number of industry friends and colleagues to visit our newly renovated space and help raise money to benefit those affected by the North Bay fires, in conjunction with Rebuild Wine Country. Before the big day, our office underwent a transformation. The materials library was converted into our Raffle Hall, with all the gifts that had been graciously donated to us from businesses all around the bay on display. We were given tickets to various museums around the city, gorgeous designer furniture pieces, books and items from local shops, and even a signed Kevin Durant jersey! Overall, a respectable haul. Our main office space remained largely unchanged, besides the conversion of my desk into the main bar and a raffle ticket station tucked against the far wall. In the days following the event, I kept a pack of wet wipes handy for leftover alcohol stickiness. The upstairs landing housed our second bar and candy station, as well as a few standing tables for mingling and conversation. As the night went on, the main floor became increasingly crowded, thus we did our best to encourage people upstairs to enjoy the view. We were lucky enough to have Matt Wrobel come by to play two gorgeous guitar performances. My only regret is that there were so many voices that his music got almost completely drowned out! We’ll have to have him back once again for a more intimate gathering. We were also happy to learn that our summer intern Parker has a knack for photography and was able to take snapshots throughout the event. To see some photos and get a glimpse of our new space, head over the Flikr album HERE. Every staff member had their assigned post for the evening which made the event flow smoothly and my stress levels remain neutral, a rare feat for any event planner! I was happy to see our guests and designers alike mingling, laughing, scouting out raffle prizes, and generally having a wonderful time. The raffle drawing occurred at the conclusion of the evening, and while everyone was able to collect their prizes in the end, I do wish I had thought to get a mic for the announcements. Our golden ticket winner chose to head home with a beautiful bench from Leverone Design. The highly coveted KD jersey ended up going home with someone who had only put one ticket in the jar! Lucky indeed. Thanks to everyone’s enthusiasm and generosity, we were able to raise $8,500 for our cause. 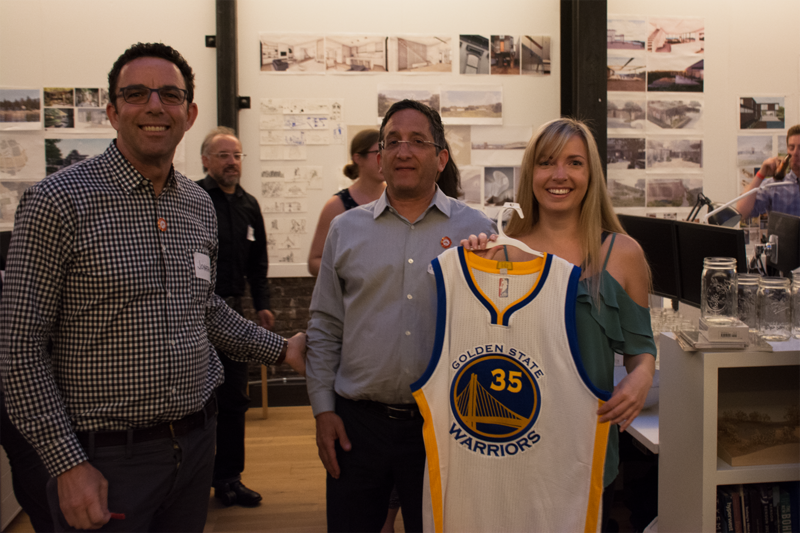 Our goal was set at $10,000, but we had the unfortunate coincidence of hosting our event the same night The Warriors were playing game 4, so perhaps we missed out on a few super-fan guests! I really enjoyed hosting such a fun party in our new space and I hope to do it again in the future. If anyone is still interested in supporting our cause and donating to Rebuild Wine Country, you can find more information on their website HERE.